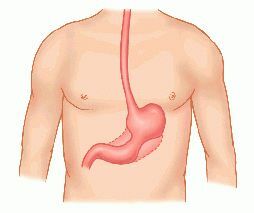 the curved, muscular, saclike structure that is an enlargement of the alimentary canal (see digestive system) and lies between the esophagus and the small intestine; called also gaster. (See also Plates.) adj., adj gas´tric. The wall of the stomach consists of four coats: an outer serous coat; a muscular coat, made up of longitudinal, circular, and oblique muscle fibers; a submucous coat; and a mucous coat or membrane forming the inner lining. The muscles account for the stomach's ability to expand when food enters it. The muscle fibers slide over one another, reducing the thickness of the wall while increasing its area. When empty, the stomach has practically no cavity at all, since its walls are pressed tightly together; when full it holds about 1.4 liters. 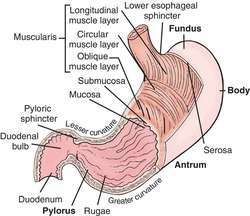 The stomach muscles perform another function. When food enters the stomach, they contract in rhythm and their combined action sends a series of wavelike contractions from the upper end of the stomach to the lower end. These contractions, known as peristalsis, mix the partially digested food with the stomach secretions and ingested liquid until it has the consistency of a thick soup; the contractions then push it gradually by small aliquots into the small intestine. The stomach is usually emptied of its digested contents in 1 to 4 hours; the time may be longer, however, depending on the amount and type of food eaten. Foods rich in carbohydrates leave it more rapidly than proteins, and proteins more rapidly than fats. The stomach may continue to contract after it is empty; such contractions stimulate nerves in its wall and may cause hunger pangs. The mucous membrane lining the stomach contains innumerable gastric glands; their secretion, gastric juice, contains enzymes, mucin, and hydrochloric acid. Enzymes help to split the food molecules into smaller parts during digestion. The physiologic action of mucin is not fully understood. Hydrochloric acid aids in dissolving the food before the enzymes begin working on it. The diagnosis and treatment of stomach disorders has changed markedly with the development of endoscopy. This benign procedure permits direct examination and biopsy of the stomach and has sharply increased the accuracy of diagnosis and, as a result, the effectiveness of medical therapy. In addition, the development of whole new families of medications that reduce gastric acid secretion (such as cimetidine) and increase gastric motility (such as metoclopramide) have decreased the need for surgery for peptic ulcer disease. Surgery of the stomach has become increasingly conservative with a better understanding of that organ's physiology. Instead of the resections that were once done routinely for peptic ulcer disease, sophisticated procedures, such as the supraselective vagotomy, that can decrease acid secretion without resection of the stomach are available. Even so, resection may still be needed for more severe cases of ulcer disease, for such complex entities as Zollinger-Ellison syndrome, and for malignancies. Anatomy of the stomach. From Ignatavicius and Workman, 2002.
cascade stomach an atypical form of hourglass stomach, characterized radiologically by a drawing up of the posterior wall; an opaque medium first fills the upper sac and then cascades into the lower sac. hourglass stomach one shaped somewhat like an hourglass. leather bottle stomach linitis plastica. stomach pump an apparatus used to remove material from the stomach, consisting of a stomach tube to which a bulb syringe is attached. The tube is inserted into the mouth or nose and passed down the esophagus into the stomach. Suction from the syringe brings the contents of the stomach up through the tube. This can be used either to remove material from the stomach in an emergency (such as when a person has swallowed poison) or to obtain a specimen for chemical analysis (such as in diagnosis of peptic ulcer or other stomach disorders). stomach tube a flexible tube used for introducing food, medication, or other material directly into the stomach. It can be passed into the stomach by way of either the nose or the mouth. See also tube feeding. Called also esophageal tube. A large, irregularly piriform sac between the esophagus and the small intestine, lying just inferior to the diaphragm; when distended it is 25-28 cm long and 10-10.5 cm in its greatest diameter, and has a capacity of about 1 L. Its wall has four coats or tunics: mucous, submucous, muscular, and peritoneal; the muscular coat is composed of three layers, the fibers running longitudinally in the outer, circularly in the middle, and obliquely in the inner layer. cascade stomach an atypical form of hourglass stomach, characterized radiographically by a drawing up of the posterior wall; an opaque medium first fills the upper sac and then cascades into the lower sac. hourglass stomach one more or less completely divided into two parts, resembling an hourglass in shape, due to scarring which complicates chronic gastric ulcer. a. The enlarged, saclike portion of the digestive tract, one of the principal organs of digestion, located in vertebrates between the esophagus and the small intestine. b. A similar digestive structure of many invertebrates. c. Any of the four compartments into which the stomach of a ruminant is divided. 2. The abdomen or belly. the food reservoir and first major site of digestion, located just under the diaphragm and divided into a body and a pylorus. It receives partially processed food and drink funneled from the mouth through the esophagus and gradually feeds liquefied food (chyme) into the small intestine. The stomach lies in the epigastric and left hypogastric regions bounded by the anterior abdominal wall and the diaphragm between the liver and the spleen. 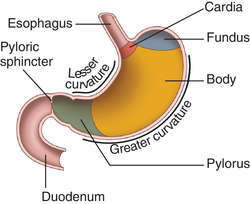 The shape of the stomach is modified by the amount of contents, stage of digestion, development of gastric musculature, and condition of the intestines. It is lined with a mucous coat, a submucous coat, a muscular coat, and a serous coat, all richly supplied with blood vessels and nerves, and contains fundic, cardiac, and pyloric gastric glands. Also called gaster. A large, irregularly piriform sac between the esophagus and the small intestine, lying just beneath the diaphragm. Its wall has four coats or tunics: mucous, submucous, muscular, and peritoneal; the muscular coat is composed of three layers, the fibers running longitudinally in the outer, circularly in the middle, and obliquely in the inner layer. Synonym(s): gaster [TA] , ventriculus (1) . It is below the diaphragm to the right of the spleen, partly under the liver. It is composed of an upper fundus, a central body, and a distal pylorus. It has two openings: the upper cardiac orifice opens from the esophagus and is surrounded by the lower esophageal (cardiac) sphincter. The lower pyloric orifice opens into the duodenum and is surrounded by the pyloric sphincter. 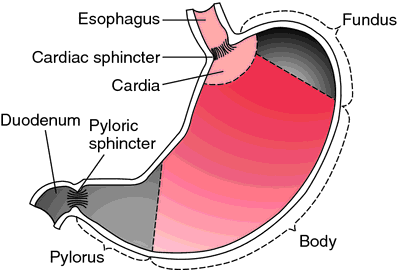 The wall of the stomach has four layers. The outer serous layer (visceral peritoneum) covers almost all of the organ. The muscular layer just beneath it has three layers of smooth muscle: an outer longitudinal layer, a medial circular layer, and an inner oblique layer. The submucosa is made of connective tissue that contains blood vessels. The mucosa is the lining that contains the gastric glands, simple tubular glands of columnar epithelium that secrete gastric juice. Chief cells secrete pepsinogen; parietal cells secrete hydrochloric acid and the intrinsic factor; mucous cells secrete mucus; G cells secrete gastrin. The stomach is a reservoir that permits digestion to take place gradually; emptying of the stomach is under both hormonal and nervous control. Secretions and motility are increased by parasympathetic impulses (vagus nerves) and decreased by sympathetic impulses. The presence of food stimulates the production of the hormone gastrin, which increases the secretion of gastric juice. Protein digestion begins in the stomach; pepsin digests proteins to peptones. Hydrochloric acid converts pepsinogen to active pepsin and has little effect on unemulsified fats except those of cream. The intrinsic factor in gastric juice combines with vitamin B12 (extrinsic factor) to prevent its digestion and promote its absorption in the small intestine. Little absorption takes place in the stomach because digestion has hardly begun, but water and alcohol are absorbed. A form of hourglass stomach in which there is a constriction between the cardiac and pyloric portions. The cardiac portion fills first, and then the contents cascade into the pyloric portion. A high, transversely placed stomach. Accidental or intentional ingestion of materials such as coins, nails, bottle tops, marbles, and buttons. In some instances, these should be removed endoscopically (e.g., copper coins). A condition of the stomach caused by hypertrophy of the stomach walls or their infiltration with malignant cells. A variant of hiatal hernia in which the stomach lies above the diaphragm. This may result from an embryonic anomaly in which the stomach fails to descend, or from a hernia of the diaphragm. A colloquial term for the pathological changes in the stomach that occur in patients with progressive systemic sclerosis. The disease affects the stomach by causing vascular ectasia in the antrum. A stomach with the pylorus situated unusually high, causing slow emptying. The bag-like organ lying under the DIAPHRAGM in the upper right part of the ABDOMEN into which swallowed food passes, by way of the OESOPHAGUS. The stomach has an average capacity of about 1.75 l and secretes hydrochloric acid and the protein-digesting enzyme PEPSIN. that part of the vertebrate gut system which follows the oesophagus, is expanded to form a chamber, and whose walls secrete pepsinogen giving rise to PEPSIN, RENNIN (in young mammals) and hydrochloric acid from the OCYNTIC CELLS. A major function of the stomach is the mechanical churning of the food by means of a muscular wall. 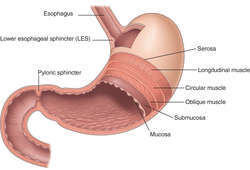 Gastric secretions also include mucin, which lubricates the food mass that is passed, a little at a time, to the SMALL INTESTINE via the PYLORIC SPHINCTER. The mixture of partly digested food and secreted fluids is known as CHYME. see DIGESTION, DIGESTIVE SYSTEM. the part of the alimentary tract just below the diaphragm. Colloquially: abdomen, belly. See also alimentary, digestion. the curved, muscular, saclike structure that is an enlargement of the alimentary canal between the esophagus and the small intestine. See also abomasum, reticulum (3), forestomachs, gastric. a stomach made up of several compartments, e.g. ruminant stomach comprising forestomachs (reticulum, rumen, omasum) and abomasum. found in horses; includes cardiac, proper gastric and pyloric glandular zones. one shaped like an hourglass. acupoints situated along the stomach meridian. includes mesogastrium, lesser omentum, greater omentum and omental bursa. in birds the gizzard or ventriculus. see frick speculum, hauptner mouth gag. For cattle there is also an instrument made out of a wooden rod with a hole through the center. This is placed between the cow's molars like a bit and held in position with a poll strap. It works adequately for a probang but is much inferior to the Frick speculum for a stomach tube. Q. Stomach ulcer or bad heartburn? hi. i am not sure if this is just heartburn or maybe i have an ulcer. for the last 7 months i have been getting really severe pains in my stomach (between my chest and my belly button). my upper back gets sharp pains and my stomach bloats out like I’m 8 months pregnant!!!. i have tried to take antacids for this but nothing works. i don’t know what else to do. it scares me sometimes because i have no idea what it is. My mom thinks it could be an ulcer. the pain lasts for a good 4 to 5 hours and i cant even sit down because the pain hurts so bad. can anyone tell me what this might be????? A. After 7 months with an ulcer you’d be vomiting blood and may have blood in your feces. Anti acid would have helped. So what you say doesn’t sound anything like it. I think a good idea will be going the next morning to see a Dr. – looking for a diagnosis on the web is not a very good idea. And even if you know for certain that you have an ulcer- it is curable. Why wait 7 months? Q. 10 weeks pregnant, stomach pain. My sister is 10 weeks pregnant and she is suffering from stomach pain from week 5 until now. I am Just wondering is it normal to have stomach pain when pregnant? and dose it go away after 12 weeks? This is her first pregnancy so please educate us. A. hmm...my wife also felt pain during those weeks (5th..? maybe 4th...? up to the 11th- not sure) but it was not constant and not very painful. she went to her gyno who checked her out and told her it's the uterus stretching but it's good that she comes to check it out cause who knows.. don't take a chance. Q. Ive been having problems with my stomach bloating and it is very tender and sore what could it be? Anyway, stomach problems can also result from serious, albeit usually rare, conditions, so consulting a doctor may be wise in this situation.